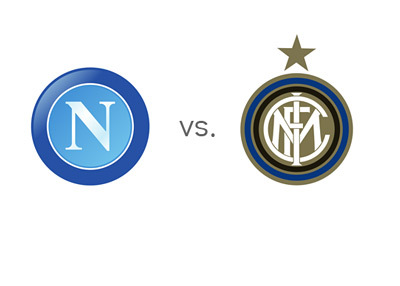 Third place Napoli host fourth place Inter in the sixteenth round of the Italian Serie A on Sunday, December 15th, 2013 at the Stadio San Paolo in Naples. Napoli are coming off a big 2-0 victory vs. Arsenal in the UEFA Champions League, which nearly saw them through to the knockout stage of the competition. In Serie A, Napoli most recently drew 3-3 vs. Udinese, after a 2-4 victory away to Lazio. Rafael Benitez's side are eight points behind first place Juventus at the moment and five points behind second place Roma. Inter, who are four points behind Napoli in the Serie A standings, most recently drew at home vs. Parma 3-3 and the week before vs. Sampdoria 1-1 also at home. In the Italian Cup, midweek, they beat Trapani 3-2 and advanced to the round of 16. A 100 € bet on Napoli, who are the favourites to win this match at home, could return 90 € in profit. The same bet on Inter could return 300 € in profit. The most likely score, as it usually is at the bookies, is a 1-1 draw, valued at 11/2. Gonzalo Higuain (21/20), Marek Hamsik (8/5) and Goran Pandev (7/4) are the favourites to score for the home side, while Rodrigo Palacio (15/8) and George Puscas (9/4) are the favourites to score for Inter. This is an important game. Both teams are already fighting for next season's Champions League spot. Let's see how things play out in Naples.